Even though I missed the actual day, I still thought it would be fun to celebrate one year of blogging with a craft and giveaway. In fact, the craft is actually the giveaway. So, if you want to skip the craft and just get the goods, then leave me a comment with your current favorite blog. You can get an extra entry for sharing this post on Pinterest, Facebook or Instagram. 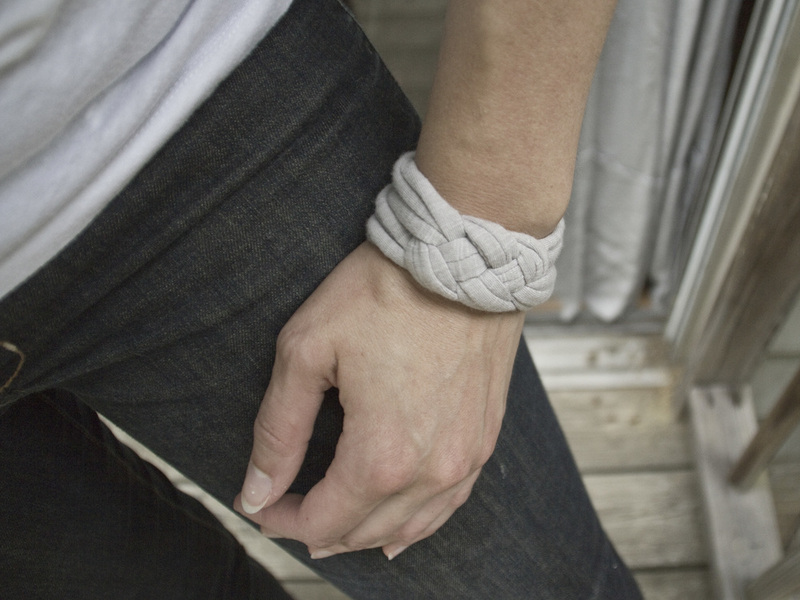 I'm not even going to try using words to explain how to make this knot, but here are some step-by-step pictures. If they aren't descriptive enough, just check out the original link. Once you have your knot, simply tighten it by easing in each of the four strand sets. Cut the ends to your desired length, keeping in mind that the closure adds about half an inch to the finished length. Next step is to stuff the jersey strands into the ribbon clamp ends. This part is important to get right. It's helpful to have a small, sharp object, like a toothpick or pointed scissor blades, to push the fabric all the way in. Once all the jersey is in the clamp, use the pliers to pinch it shut. Finally, use the pliers to open the metal rings and attach the clasp. And that's it. You can experiment with different widths of jersey and ribbon clamp ends. I made some thinner bracelets with 1" strips and 1" ribbon clamps that were perfect for my daughter's wrist. I also made some bracelets that were slip-on, by sewing the ends of the jersey together at the back. Don't forget to leave a comment with your favorite blog for a chance to win a bracelet—your choice of color. Extra entry for sharing on Pinterest, Facebook or Instagram. I'll do the drawing next Wednesday.